Four talented teenagers from a Coventry academy have taken the chequered flag after being crowned national champions in a Formula One competition. Elias Khimasia (15), Eddie Hodierne (17), Abi Hirons (16) and Callum Kennedy (16) – otherwise known as Academy Racing - won the UK championships of the annual F1 in Schools competition at Silverstone. 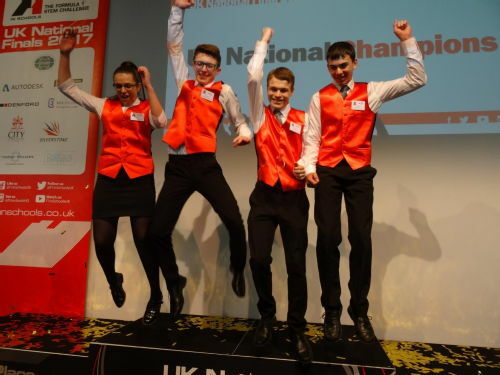 The four team members, who are all students at WMG Academy for Young Engineers, are now heading to the world championships in Malaysia to compete against teams from 44 countries. The F1 in Schools challenge sees students from all over the globe compete for the Bernie Ecclestone F1 in Schools World Championship trophy. This involves using CAD/CAM computer software to design, analyse, manufacture, test and race miniature F1 cars. The cars are powered by a small CO2 cylinder and can reach speeds of over 50mph over a 20m track. As well as the national title, Academy Racing also won the trophy for the fastest car. The winning team received support and sponsorship from over 15 local businesses including; Autins, Cov Con, Coventry University, GRM, High Profile, I2m, JLR, Lear, LTF, Squires Gears, Suretrack, WMG, WMG Academy, Warwick EDM and the University of Warwick. WMG Academy, in Mitchell Avenue, Canley, Coventry, offers students the chance to study science, technology, engineering and maths in a purpose-built centre featuring a state-of-the-art workshop, 3D printers and the latest design software. The academy also boasts its own Jaguar car and works in partnership with the University of Warwick and businesses to provide students with a career-based education. For more information email c.lewis@wmgacademy.org.uk or call Calista Lewis on 024 7646 4661.
business-focussed, practical problems and challenges at the centre of their curriculum. With the support of sponsoring companies, this new approach prepares them for the challenges of the 21st century, whether they be in companies, in further education or at university. The WMG Academies for Young Engineers are currently taking applications for students to start in September 2017.